You will be given a reference e-book to read which has 306 pages And the test will be based on that e-book , you can take final test within 1 year of purchase. An IT manager is a professional in the information technology industry who is greatly involved in effectively establishing a more strategic IT plan while overseeing the IT performance of a specific organization. The major responsibilities of an IT manager can be expected to greatly differ depending on the specific size of the organization where he/she is working and its structure. This manager also performs essential managerial tasks such as supervising the maintenance, security and development of information network and computer systems. If you decide to work as a certified IT manager, then be aware that your responsibilities will also include testing and evaluating the performance and integrity of a wide range of software applications and information networks. You will also be tasked to review and evaluate periodically the ability of the present applications and systems to meet the specific requirements of an organization. You will have to research and implement more advanced technologies that are effective in enhancing the strategic and operational goals of an organization for the long term. As an effective IT manager, you will also be in charge in performing business planning activities especially those that involve defining the presence of an internet connection within an organization. Other responsibilities that you need to perform include keeping track and encrypting collected information from consumers, monitoring and developing tools designed for online community including surveys, feedback forms and message boards and overseeing the installation and upgrades of hardware and software that are extremely useful for both intranet and internet sites. If you have longed to become part of the IT industry and work as an effective information technology manager, then the IT manager certification program from a reputable online certification company known as Brainmeasures is greatly suitable for you. You will enjoy taking up this IT manager course from Brainmeasures since it works in effectively detailing all aspects in the IT management field. It allows you to undergo an IT manager training which is guaranteed to help you understand the scope of work of an IT manager, his usual responsibilities, duties and roles, the different information technology tools and systems that he handles and the many tips, techniques, approaches and strategies that you can use to securely and efficiently perform your functions. 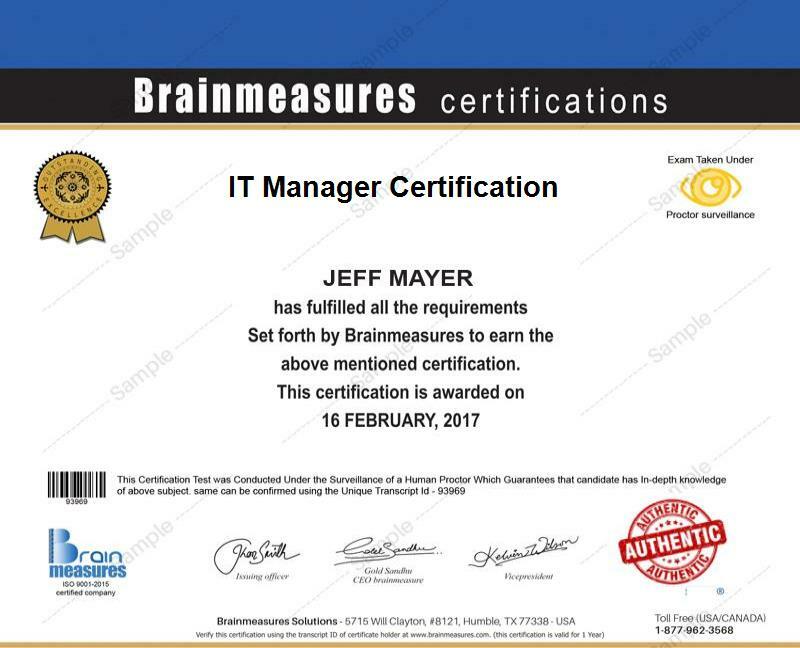 Receiving a certificate from Brainmeasures will transform you into a certified IT manager which will make it easier for you to impress prospective employers in the information technology industry. How to live with legacy systems? The IT manager certification program which is now easily accessible at Brainmeasures can be expected to work for all those who wish to understand everything about IT management and governance. It is suitable for all aspiring and existing IT professionals, managers, consultants, technicians and engineers who are also in charge in performing managerial functions linked to information technology. Your decision to enrol in an IT manager certification course and finish it can also help you reach your most desired salary level. Your certification can help you work as an IT management consultant and earn around $117,000 per year along the process. You will also enjoy the financial rewards of working as a certified IT manager since the annual salary involved in this profession is usually around $79,000 to $163,000.